How Uber Triggered OLA’s Recent Funding of $330 Million? Ola cabs, Uber’s competitor and India’s largest market shareholder in radio taxi services market in a fresh round of funding raised $330 million from its largest shareholder – SoftBank group. The Japanese venture capitalist is the largest investor in the Indian cab firm. The investors reduced the valuation of OLA Cabs from a peak of $5 Billion in 2015 to about $3.5 Billion. This is not the first time when a fresh round of funding ended with a reduction in valuation. This is what SoftBank did to its other major investment – India SnapDeal. The massive 30% reduction in the valuation of OLA cabs had put further questions in the investors’ minds about the viability of the project but the fresh funding has put aside such doubts for a bit longer. OLA cabs, founded by IIT Bombay graduates Bhavish Aggarwal and Ankit Bhati in 2010 is facing tough competition in maintaining its role as the leader in the market with the entry of Uber in India. Uber is a multinational cab services startup with headquarters in the U.S. It is the world’s most renowned taxi service company with a market valuation of over $60 Billion. Uber considers India as its biggest market after United States and pledged to invest at least $1 Billion in India. The ride-hailing startup has recently exited China which means it can be more aggressive in the Indian market. A distant second player in India’s relevant market, Uber is continuously burning more and more cash. They try to capture the bulk of the Indian market while it competes with OLA cabs. OLA after this fresh funding and renewed investor trust have raised more than $1.2 Billion since its foundation in 2010. The aggressive spending by its leading competitor Uber is pushing the startup to expand its operations throughout India. 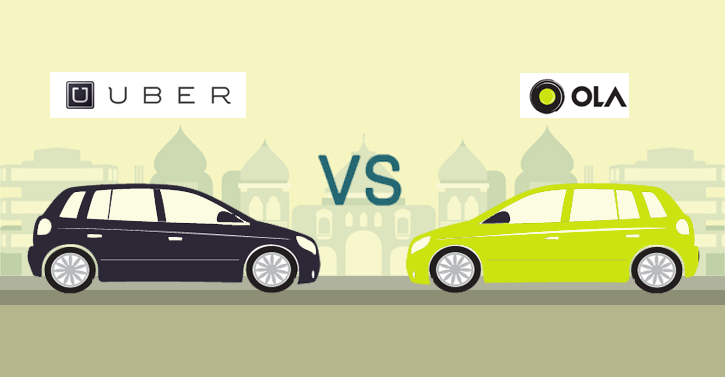 OLA cabs based on Uber’s business model has successfully revolutionized the Indian cab services market. More and more people are using the ride-hailing app’s services to ensure a smoother and safer travel. Uber has become the world’s largest cab service provider without owning a single vehicle. All vehicles at the company’s behest are on lease and run on the driver’s availability. Uber with its deep pockets has put OLA under immense pressure. It needs to raise more funds to maintain its position as the market leader in India. This round of funding took more time than the ride-hailing app based startup company had predicted with investors’ confidence shaken after the entry and the growth of Uber in India. OLA has contracted more than 200,000 cars in India to expand its fleet and services across 100 cities. They want to launch their services in other countries, because Uber is no longer their only competitor that matters and worldwide market sharing will provide them several benefits. OLA spends about $40 Million a month to keep its services running and maintain its market share. Uber spends around $30 Million and it will reach $40 Million as they continue their expansion in the Indian market. OLA has launched various products to woo customers across India. For instance, Ola Micro and Mini cabs which provide cheap travel services in hatchback vehicles. The startup has also launched its OLA Auto product after testing it in Bangalore on a pilot basis. While these are cheaper options of commute, the app based service has also forayed into providing luxury vehicles to woo premium customers. Another new product the company has launched in the recent times is the OLA Outstation cabs. These cabs are dedicated for outstation travel and come with special tariffs. OLA Cabs CEO Bhavish Aggarwal has been vocal about the unfair competition OLA cabs are facing from foreign players such as Uber with deep pockets. The deep pockets of giants of the industry such as Uber push the domestic companies to their limits with aggressive strategies. This reduces the confidence of the investors’ in domestic companies. It leads to startups like OLA cabs to look for new investors to fund their expenses. This also happened in the e-commerce industry. An example here would be Flipkart which have been struggling to compete against the deep pockets of Amazon and its aggressive marketing and operation strategy. Financial advisors say that the most recent scandals inside Uber: President Jeff Jones leaving the company six month after joining Uber, CEO Travis Kalanick’s poor behavior while arguing with the driver of his Uber-Black can harm the company in the short run. However, receiving more funds at a time when OLA cabs was trying to limit its expenses by increasing fares and reducing driver incentives did nothing else but to grow speculation about the ride-hailing startup’s viability and how the company will stay afloat while competing with Uber. At the end of the day all that matters is customer service and profitability. We will see which one has both.